Glands are organs in a mammal's body that synthesize a substance for release such as hormones or breast milk. These substances are often released into the blood stream (endocrine gland) or into cavities inside the body or its outer surface (exocrine gland). 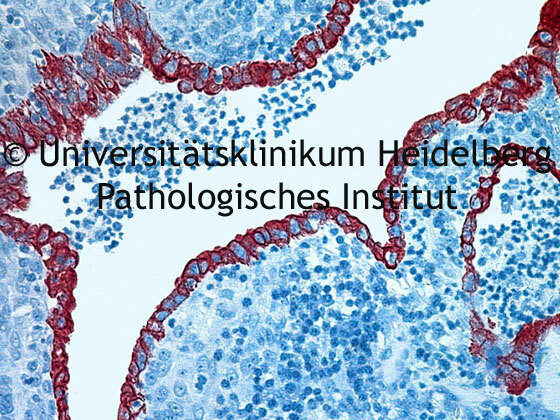 Image of gland lumen captured under a biological laboratory microscope with the Jenoptik C14+ microscope camera. Endocrine glands secrete their products through the basal lamina and lack a duct system. 1. Serous glands selecrete a watery, often protein-rich product. 2. Mucous glands secrete a viscous product, rich in carbohydrates (also known as glycoproteins). 3. Sebaceous glands secrete a lipid product (also known as oil glands). Glands are classified by their shape. If the gland retains its shape as a tube throughout it is termed a tubular gland. If the portion of the gland where it secretes is enlarged and the lumen increase in size, the gland is termed alveolar or saccular.